Sometimes you crave a classic, homemade lasagna. And then you think, who’s got the time for that? No matter how many times I make it, I have to keep checking the order. Not to mention it uses up half the dishes in the house. Now, don’t get me wrong, it’s totally worth it. But there are some nights when you just don’t feel up to it. This is a cheater’s, lazy (wo)man’s lasagna that totally gets the job done in half the time. You don’t even have to cook the ravioli ahead of time. 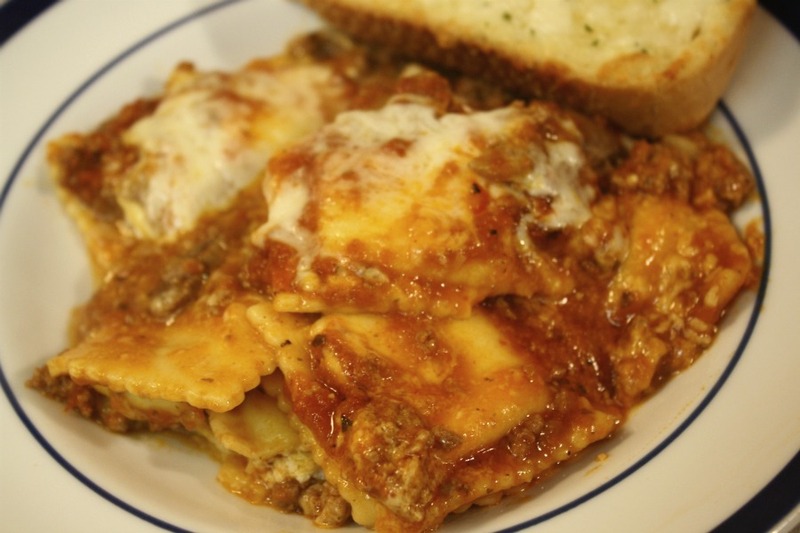 And whoever you might feed this to will think it’s classic lasagna-worthy. Reminds me of that old Rice Krispies Treat commercial where the mom pretends to be slaving away. So, pop this baby in the oven and sit back and relax. Note: For a vegetarian option, you could sautee some other veggies with the mushrooms, or add more mushrooms! In a large skillet, cook beef along with the mushrooms over medium heat until no longer pink, and drain. In a greased 2-1/2-qt. 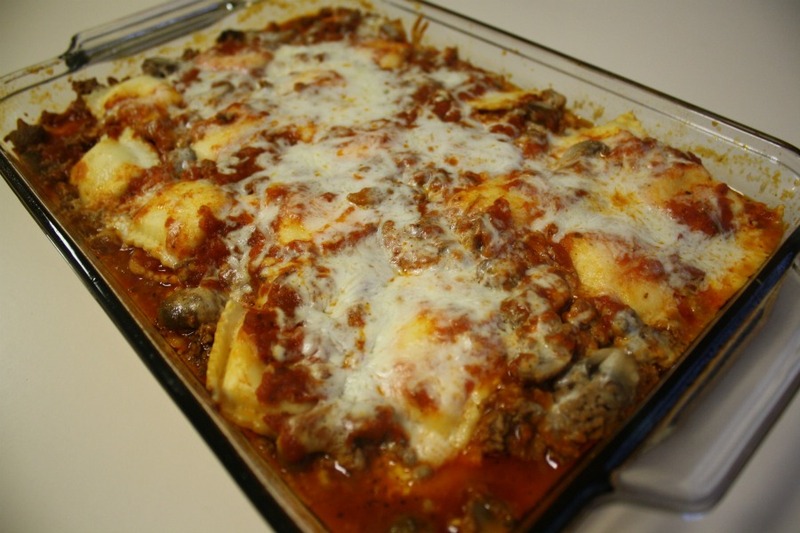 baking dish, layer a third of the spaghetti sauce, half of the ravioli and beef and 1/2 cup cheese; repeat layers. Top with remaining sauce and cheese. Cover and bake at 400° for 40 minutes or until heated through. This entry was posted on Sunday, January 22nd, 2012 at 11:36 am and is filed under Entrees. You can follow any responses to this entry through the RSS 2.0 feed. You can leave a response, or trackback from your own site. Wow! That looks better than any classic layered lasagna. And the mushrooms must be a wonderful addition. You just made me very hungry, haha! Good job! Haha, thanks! I always add mushrooms to any lasagna of mine. Goes so well with sausage or beef – or by itself! Oh my word…that looks delicious! Thanks! :) Your sweet potato biscuits look killer! I’m dying for this! Usually we save lasagna for Sunday since it takes so long. But this… this is madness and genius!